Afternoon: Monk Blessing on the Beach. “Serene, Magical, Exotic” These are words commonly used to describe the ceremonies we offer amidst the setting of a real life paradise where our ceremonies take place. Sparkling emerald green waters juxtaposed amid the backdrop of lush greenery, it is of no surprise that Thailand is home some of the most beautiful beaches in the world. With countless islands to choose from, you are sure to find that perfect beach. 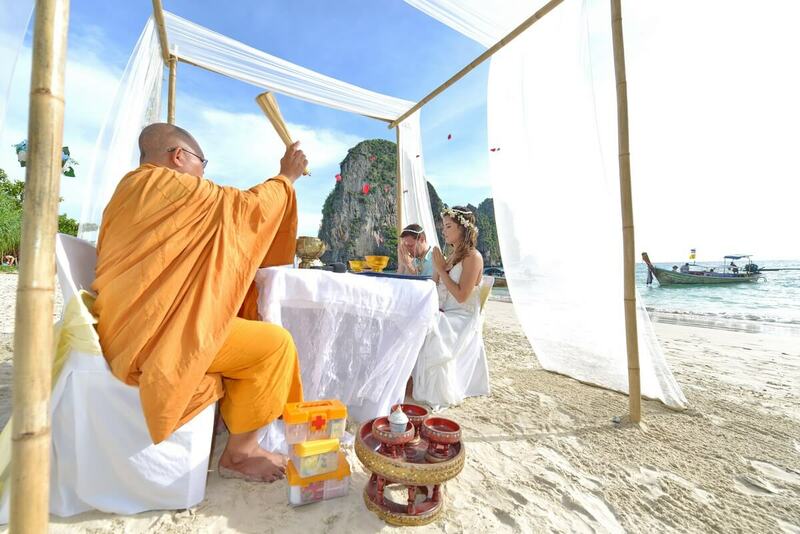 A sacred blessing by Thai Buddhist Monks is the perfect way for couples seeking a once in a lifetime experience in their relationship. A blessing is an attempt to contact and share that which is good, particularly in a divine sense. One is trying to make contact with the force of goodness itself and to share this ‘energy’ so that it might pass on some of that energy to those present. Short Description: A sacred blessing by Thai Buddhist Monks is the perfect way for couples seeking a once in a lifetime experience in their relationship. A blessing is an attempt to contact and share that which is good, particularly in a divine sense.